It seems to be getting more and more common that Adobe Reader (previously known as Acrobat Reader) is the target for phishing scams and malware. 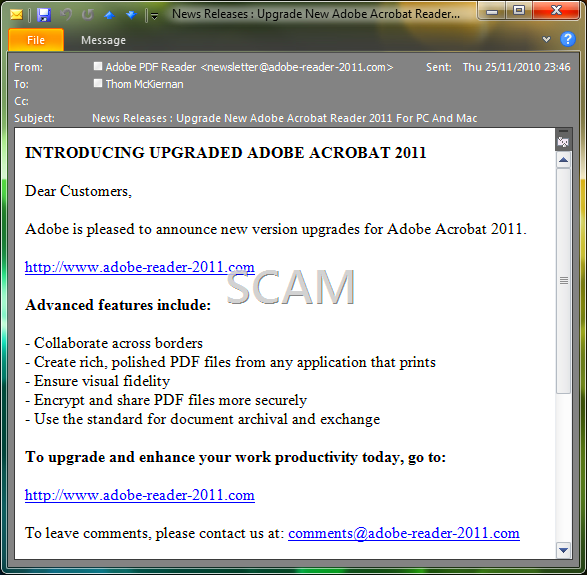 Today I got another email pretending to be from Adobe alerting me of new updates to Reader. This can easily lure the reader into clicking before reading the message properly. There are a few thing that should ring alarm bells to someone who works with computers e.g. It is sent from a newsletter that I haven’t subscribed to.